So, this is more of me trying to expand my reading genres or open my mind or some junk like that. I’ve always been of the opinion that I don’t read Graphic Novels but Deadly Class, Vol. 1 by Rick Remender just might make me change that opinion. It’s 1987. Marcus Lopez is homeless. He is running from his past. He gets sorta rescued, if you could call it that, by the headmaster of Kings Dominion School for the Deadly Arts, where the teachers are members of an ancient league of assassins. Welcome to the most brutal high school on earth, where the world’s top crime families send the next generation of assassins to be trained. Murder is an art. Killing is a craft. At Kings Dominion School for the Deadly Arts, the dagger in your back is probably real. 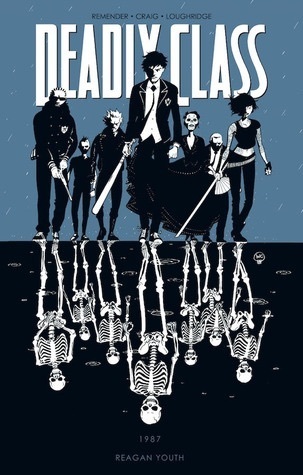 Deadly Class, Vol. 1 has a slow start but once it takes off, it is fast pace, dark, and gritty. There is an incredible amount of character development for the main and supporting characters. It’s not just a lot of meaningless and violent actions scenes. No real experience here with Graphic Novels but the violent scenes are no joke and not sure if this is really a YA Graphic Novel. But it is clearly well thought out and well structured and is a very good beginning to the series. Yup, will read Vol. 2. This entry was posted in Adult Fiction, Graphic Novel and tagged Deadly Class, Graphic Novel, Lee Loughridge, Rick Remender, Vol. 1, Wesley Craig. Bookmark the permalink. Deadly Class is fantastic. Read the first volume in an afternoon and immediately ordered volume 2. No spandex, no capes. It’s a really original concept with some very, very real moments. Took me back a few times. Try Saga (also from Image) if you have the chance. Out of this world in terms of ideas. The art is gorgeous and the story… Can’t do it justice with my words.